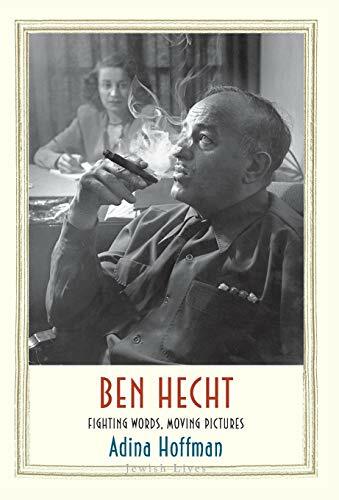 Adina Hoffman’s compact biography of screenwriter turned political activist Ben Hecht is an altogether dimensional portrait of a true Jewish American original. It is atmospheric, incisive, and populated with New York’s literati of the ’30s, not to mention all the Hollywood stars eventually in Hecht’s orbit. Admirably, Hoffman upstages the celebrity dazzle with the journey of Hecht’s awakening as a fearless voice against the rise of anti-Semitism and the coming Holocaust in Europe. In the ’20s, Hecht was a hard-drinking, cynical Chicago newspaperman and populous reporter writing about everyday Chicagoans. He was also on a dual track with the highbrow literary magazine, along with Theodore Dreiser, James Joyce, and Dorothy Parker, but he left the print business for his chances on Broadway, working with co-writer Charles MacDonald, turned out two Broadway hits, The Front Page and Twentieth Century. Hollywood soon beckoned, and he wrote the story for Josef von Sternberg’s silent classic Underworld, a thrilling film genre populated with gangsters, molls, speakeasies, dirty cops, and louche glamour. When sound entered the movies, his hits included Hollywood classics The Front Page, Scarface, Gunga Din, His Girl Friday, Notorious, Design for Living, Gone With the Wind, and many more. Hecht became the highest paid screenwriter in Hollywood, and he was the on-demand script doctor for industry giants including Howard Hughes, David O. Selznick, Howard Hawks, Alfred Hitchcock, and Ben Mankowitz. Hecht had a love/hate relationship with Hollywood’s screenwriting “factory,” which he considered hack work, yet he thrived in the chaotic and libertine film culture. He was the highest paid screenwriter in the industry, but creatively frustrated. Still, he took the money and ran. He rationalized matters in his private life as well. He was madly in love with his first wife Marie Armstrong (Hecht), a fellow journalist, but they split up after Hecht started a very public affair with Rose Caylor, his second wife, also a successful writer. He was a philandering family man with two daughters to provide for. Rose tolerated it more than Marie, who would go on to write a scathing expose about their life together. In the late ’30s, Hecht was deeply disturbed by the rise of international anti-Semitism and America’s political and cultural silence over the events in Europe. He alienated the Jewish movie moguls in particular for not doing more to raise awareness and money for the cause. He became a fierce advocate to help Jews escape fascism and the atrocities of the coming Holocaust. Feeling the heat from Hollywood, but not backing down, Hecht used hard-edged tactics including scabrous satires and agitprop ads, even alienated many in the American Jewish religious establishment. His notorious novel A Jew in Love, both vilified and championed, but nonetheless sold 50,000 copies in its initial printing. Hoffman provides deft analysis of the novel’s many implications—Was it a parody of Jewish stereotypes? Or was Hecht projecting racial self-loathing as some labeled it? Or were some jealous that Hecht was more influential than political and religious leaders in rallying Jewish-Americans to fight for the Jews imperiled Jew across Europe? Peter Bergson, a freedom fighter in the underground paramilitary Zionist organization Irgun, working to form an Israeli army and state, convinced Hecht to join the cause. They had a contentious beginning, but Hecht eventually saw the dire necessity of immediate international intervention against Nazi atrocities against Jews. Hecht wrote plays and staged public protest performances that were now drawing wide support among American Jews, even as it continued to shame excoriated American Jewish leadership and celebrities for not publically joining the fight. He paid the price for his j’accuse and incendiary performance agitprop. Hecht was blacklisted inside the industry, his finances diminishing. Yet he continued writing, often without screen credit or in other forms. Even later in his career, his memoir Child of the Century was a bestseller. Adina Hoffmann’s admirably condenses a lot of literary, theater, movie and socio-political history in an otherwise fascinating study of Hecht, the man, the writer, the cad, and the reluctant, but fearless Jewish American activist.